Effectively managing the budget, sales, and financial reports of your restaurant are not at all an easy task. Agree? Despite carrying out things precisely, still, manual methods fail when compared to automated processing of daily restaurant tasks. The technology is always evolving and the best thing is that the food industry fetches the maximum benefits out of it. POS systems are the biggest evidence in regard to the advancement in the food business. Is your restaurant getting the expected sales? Which food category receives more food orders? Food quality is falling in which all categories? All these tasks are easily streamlined with the implementation of POS system into your restaurant. Not only this, POS system manages each and every single task carried out in your restaurant very effectively and accurately. Apart from that, you must be wondering that how would you save money using a POS system? Isn't it? 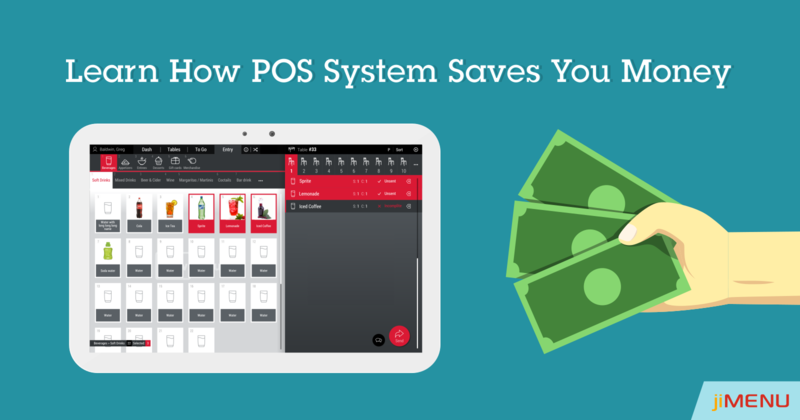 So, wasting no more time, let's have a quick view of how the POS system saves you money! Quick Serving Process: On more busy days and peak hours, it becomes difficult for the restaurant staff to remember and manage multiple orders at a time. A single mistake in an order can further result in unhappy customers. Implementing a POS system takes the orders completely and correctly while accelerating the process of taking orders and sending them to the kitchen areas soon after. Inventory Management: Keeping a check on the inventory of your restaurant is one of the important tasks for you. Using the POS system will make it easy to track the stock and avoid the hassle while you prepare a record of stock list. Centralized Information: In case you have multiple outlets, checking which outlet is getting more sales, which food category is more liked by the customers, and many other things can be easily kept into record using POS system. Getting the relevant data in return will let you take better decisions and utilize money in the right place. Reduced Labor: Engaging a huge labor while carrying out the daily tasks and managing the chaos accompanied with it is not at all easy. Using a POS system reduces the costs spent on engaging wide labor and carry out the things over an automated platform while getting the accurate outputs. Mobilising Operations: Making the billing process faster and accurate, checking the availability of vacant and reserved tables, sales report, and other tasks are just only possible with the POS systems. This directly reduces the costs you have to bear while carrying out these things manually and engaging your staff into it. Customer Data: Every time a customer visits your restaurant, you can get through their order list and get an idea about their interest areas. This data can be used in future to share deals, discounts, and other offers and shared with the customers to attract them to visit again. Saves Staff Time: Instead of engaging your staff to manage the tables, take the orders, forward it to the kitchen area, you can directly automate the whole process and save a huge time of your staff. Rather you can utilize this time while focusing on improving the food quality and enhancing the customer experience. Choosing an ideal POS vendor for your restaurant! jiMenu POS is one such perfect restaurant management solution which streamlines your restaurant tasks in the most effective way. All the features under jiMenu POS are offered to you at the most affordable prices. Want to try out jiMenu POS? Get in touch with us at any time and know more about us!